Its’s been awhile! It’s recovery week, and when they say “recovery”, I assumed we take it easy. To that, I say a big NOOOOOOOOOOOOO. Most of the focus was on abs and obliques. But it’ll be a good way to start burning the fat around my lower abs :-/. LOL! Maybe I was counting my switch kicks wrong (one per each leg? ), so that jump from 24 to 110 might be erroneous? I didn’t realize how out of shape I was on day one! I didn’t even have to pause the video to give me more time for rest like I did before! Of course, my numbers became worse when it came to leg exercises (darn you, Globe Jumps!) but did better at Burpees even though I felt dizzy. This gives me more confidence of the impending doom exercises to come! We’re on to day twelve of the program and I was (kind of) on fire! Because of my binge eating yesterday, I decided to pick up the pace a little…with the warm-up. It’s silly, but I am now able to transition into the next routine without stopping…until I have to stop a little when I’m in the next exercise. But still, I am proud of what I’m able to accomplish! I got a little woozy from when he started jumping around during the main exercises (Globe Jumps, anyone? ), but I did those at my own pace before I might have injured myself. The one thing I have been noticing for the past few days is that I don’t feel as big and squishy even though I think I still look the same. I feel better about my tummy even though it still holds the same measurement as when I posted them earlier. I don’t feel bloated, and I can keep up with more of the workout. Yay! I’m not going to spiral down into depression if I don’t see those flat abs! This is so much better than getting a trainer at a gym. I’m saying this as a person who has been through little bouts of exercise from time-to-time, not as a person who has consistently led a sedate life. If you need a trainer to help you get started, by all means, feel free to do so. I’m just bitching about how I could have saved a LOT of money because, looking back, I didn’t need a trainer. First of all, this is BY FAR cheaper than what you can find. Two, I know myself, so I can push harder or ease up as much as I can. And the most important thing is that I can do this in the convenience of my own room. Insanity – Day 11 and Burgers …Again. Ugh…it was Cardio Recovery so it was an easy workout, but I easily ruined it with burgers (watched Bob’s Burgers new episode) and open-faced steak sandwiches. These sandwiches the BF made are SO DELICIOUS! Okay so this might not look very appetizing to everyone, but when you’re starving, counting down the minutes until lunch break, and hoping no one brings you any work to do, this was my equivalent of eating at Texas de Brazil. 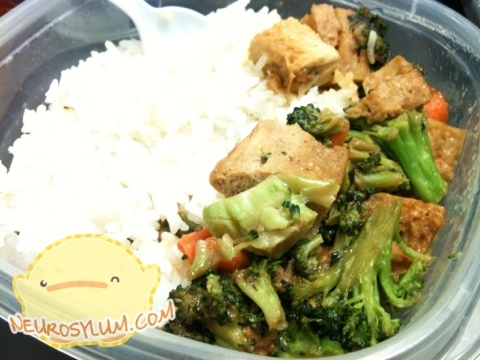 All this contains is tofu, carrots, and broccoli stir-fried in oyster sauce and soy sauce on top of rice.